Ghostfish Brewing Expands Distribution to Vermont December 12, 2017 FOR IMMEDIATE RELEASE Seattle, WA (December 12, 2017) — Ghostfish Brewing is excited to announce its new partnership with Vermont Beer Shepherd to bring its boundary-pushing craft beers to Vermont, expanding Ghostfish’s distribution from the Pacific Northwest to the Northeast. “VT Beer Shepherd is proud to partner with Ghostfish to bring their award-winning beers to Vermont,” says VT Beer Shepard co-founder Indy Ewald. “Ghostfish is a wonderful addition to our gluten free offerings, as well as appealing to the most discriminating craft beer drinker.” “Over the past few years we’ve received a flurry of requests from people in the Northeast asking us to bring our beer to their area,” says Ghostfish co-owner Brian Thiel. “We are thrilled to partner with VT Beer Shepherd to share our beers with more people across the country.” Up to this point, Ghostfish beers were distributed in Washington, Oregon, and Northern Idaho. Ghostfish is making its Vermont debut with three of its packaged award-winning beers—Grapefruit IPA, Vanishing Point Pale Ale, and Shrouded Summit Belgian White Ale. About Ghostfish Brewing Company Ghostfish Brewing is the first and only dedicated gluten-free craft brewery located in Washington state. Since opening in February 2015, Ghostfish Brewing has been exploring the uncharted waters of never before-used brewing techniques and testing the limits of what can be created with malted millet, buckwheat and brown rice. The production brewery and taproom are located at 2942 1st Ave S, Seattle, WA. Learn more about Ghostfish Brewing’s beers, brewery and taproom on its website or Facebook page. 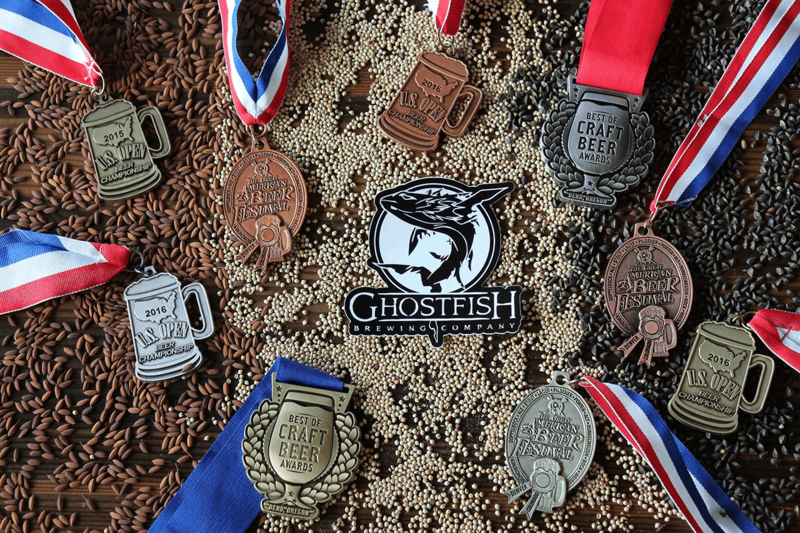 Ghostfish brews six year-round beers; Vanishing Point Pale Ale (2017 Bronze Great International Beer, Cider, Mead & Sake Competition Gluten Free Beer, 2015 Gold U.S. Open Beer Championship Gluten Free Beer), Shrouded Summit Belgian White Ale (2017 Silver Great International Beer, Cider, Mead & Sake Competition Belgian and French Ale - Belgian Witbier, 2017 Silver Best of Craft Beer Awards Gluten-Free Beer, 2017 Sip Northwest Silver Best Belgian-Style), Grapefruit IPA (2017 WA Beer Awards Bronze Speciality & Historical Beers, 2016 Gold U.S. Open Beer Championship Gluten Free Beer, 2015 & 2016 GABF® Bronze Gluten Free Beer), Meteor Shower Blonde Ale (2017 GABF® Silver Gluten Free Beer), Peak Buster Double IPA (2017 Gold Great International Beer, Cider, Mead & Sake Competition Gluten Free Beer), and Kick Step IPA benefitting The Mountaineers. About Vermont Beer Shepherd Vermont Beer Shepherd is a new wholesale craft beer distribution company hailing from Waterbury, Vermont in the heart of the Green Mountains. This small, independent, family-owned distribution company is committed to providing an outlet for the small, independent craft brewer. Vermont Beer Shepherd’s mission is to corral and protect a diverse floc of craft brands from around the globe ensuring a safe passage from independent brewer to beer lover so the consumer has the best beer experience possible.